Calling all Health Activists for Recognition! Health Activists are online leaders who work daily to improve the way people talk and think about health – active in multiple communities, passionate about health causes, dedicated to finding the best information, and relentless in their commitment to helping others. They also use every tool possible to lead their communities, especially through social media. When I learned about this cool upcoming program for recognizing some of them, I knew that you would want to hear about it too! In December, the online health community and WEGO Health will be celebrating all the awesome achievements made in health leadership and patient advocacy in 2011! WEGO Health, a different kind of social media company dedicated to empowering Health Activists, has just launched the first-ever Health Activist Awards program, to recognize Health Activists (both new and established) for all of their great work over the course of the year. You can get involved by nominating your favorite Health Activists by sharing what has inspired you, moved you, and made a difference in the online health community. I have already nominated some of my favorite Health Activists and I hope you’ll take some time to recognize your favorites too. There are 10 different awards. I am sharing them here so that you can start thinking about those who have inspired you in each of these categories. Rookie of the Year - The Health Activist who came on the scene in 2011 but has inspired the entire community. Best in Show - This Health Activist dominates a particular platform and is a great model for taking it to the next level. Nominate! Paperboy Award - The Health Activist who always brings you the latest and greatest news and research. Health Activist Hero - Who has changed your life? Recognize the Health Activist who has made a significant impact on you. Advocating for Another (Best Parent or Caregiver) - Award the dedication of someone who raises awareness for the condition of someone they love. TMI Award (Too Much Information!) - This Health Activist always goes there - no matter how personal or embarassing the story. Hilarious Health Activist - You swear you're at a comedy show. This Health Activist brings the funny with the advocacy. Offline Crusader - This Health Activist did amazing things offline this year. Tell us about your favorite. Best Affirmation Post - Recognize the best single post that explains, outlines, or affirms the Health Activist mission. Best Kept Secret - Help us find the hidden gem of the Health Activist world - and share them. You can check out WEGO Health’s Health Activist Awards 2011 homepage to nominate your favorites, as well as information on how to join the Health Activists Awards Jury to help select the Award winners, and to find out what Health Activists will win if they’re chosen. 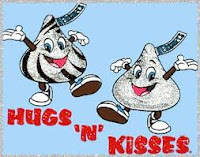 Together, let's celebrate the Health Activists that have made the biggest difference 2011. Today is World Diabetes Day! We are off to a great start this World Diabetes Day! Blue fingernail polish -check. Blue shirt - check. Blue circle hair accessory - check. Blue circle blueberries for breakfast - check. And best of all...Morning blood sugar of 114 - check! World Diabetes Day is the day that people all over the world are uniting for diabetes. November 14 was chosen as the day to raise awareness for diabetes because it is the birthday of Sir Frederick Banting. Banting, along with his assistant, Charles Best, discovered insulin in 1922. Sir Frederick Banting was one of the twentieth century's most celebrated medical heroes. His discovery of insulin, made with his assistant Charles Best and other colleagues, was one of the most important medical breakthroughs of the century. Since its discovery, insulin has saved or transformed the lives of millions of people with diabetes. You see, prior to his discovery of insulin, a diagnosis of type 1 diabetes was a death sentence. I can't even find the words to justly describe how grateful I am to this man whom I never even met. It is thanks to him that my daughter is "just a normal girl" - despite diabetes. Happy Birthday and Thank you to Sir Frederick Banting! So, why all the blue circles?? The blue circle is the international symbol for diabetes awareness. You can read about the history of the blue circle here. 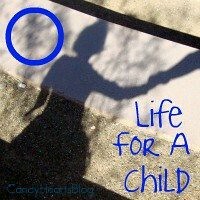 If you'd like to help spread awareness of diabetes and don a blue circle...check out www.idf.org/worlddiabetesday. "People have diabetes because we've been fed too many fatty, sugary foods over time and it has depleted our insulin stores." "People are born with type 1 diabetes or develop type 2 later in life." "That's why its important to keep those honey buns away from your grandma!" At this point, I am texting furiously back begging my sister to "pop in AND pop HER!" I so badly wanted to drive over and do some educating of my own. I guess, in all fairness, I should say that I don't really blame the people who don't know the facts about type 1 diabetes...or even that there are two kinds. I really didn't know before Ally's diagnosis. It's no wonder that there are so many misconceptions about diabetes though, if there are people "training" others who don't even have it straight. Diabetes Fact #1: Type 1 Diabetes is an autoimmune disease in which the body's immune system attacks and destroys the insulin producing cells in the pancreas. Diabetes Fact #2: No one knows exactly what causes type 1 diabetes. However, it IS known that it is NOT caused by poor diet or lack of exercise. Scientists believe that both genetic and environmental factors are involved. Diabetes Fact #3: Type 1 diabetes, sometimes referred to as Juvenile Diabetes, can strike at ANY age. Diabetes Fact #4: Type 1 diabets can occur suddenly and causes a dependence on insulin for life. Until there is a cure. Diabetes Fact #5: To stay alive, people with type 1 diabetes must take multiple insulin injections daily or continually infuse insulin through an insulin pump. Diabetes Fact #6: People with type 1 diabetes must test their blood sugar 6 or more times a day by pricking their fingers. Ally's fingers look dirty - but when you look closer you see tons of tiny holes. Diabetes Fact #7: While trying to balance insulin doses with food intake, daily exercise and activities, people with Type 1 Diabetes must still always be prepared for serious hypoglycemic (low blood sugar) and hyperglycemic (high blood sugar) reactions which can be life threatening. Diabetes Fact #8: While insulin injections or infusions allow a person with type 1 diabetes to stay alive, insulin does NOT CURE diabetes. Diabetes Fact #9: No matter how diligent a person with type 1 diabetes manages their disease, bad things can still happen. Simply injecting insulin and counting carbohydrates does not necessarily prevent complications. Diabetes Fact #10: Complications of type 1 diabetes include: kidney failure, nerve damage, blindness, amputations, heart attacks, stroke, and pregnancy complications. Diabetes Fact #11: Other factors that affect a person's ability to tightly control their diabetes include: stress, hormonal changes, periods of growth, physical activity, medications, illness, infections, and fatigue. I voted today. Lexi went along with me and had big fun with several of the "I love voting" (Ohio style!) stickers just like the one above. There were several choices to be made on our ballot. I always vote, but today I was especially there to choose a school board candidate that I supported. As we were driving away, I was thinking about choices. 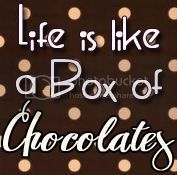 Many things in life happen without our choosing. We can't do anything about them. However, we can choose how to respond to them. 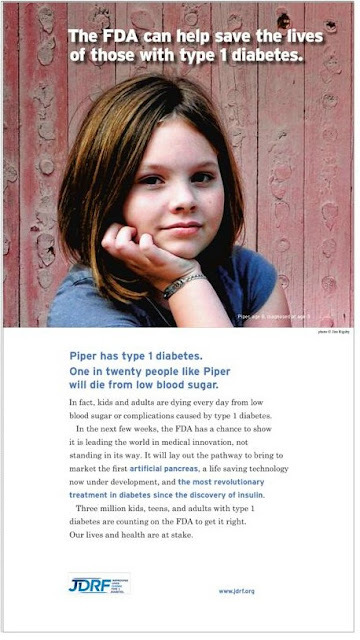 JDRF recently ran a full page ad in the Washington Post and New York Times. In fact, kids and adults are dying every day from low blood sugar or complications caused by type 1 diabetes. In the next few weeks, the FDA has a chance to show it is leading the world in medical innovation, not standing in its way. It will lay out the pathway to bring to market the first artificial pancreas, a lifesaving technology now under development, and the most revolutionary treatment in diabetes since the discovery of insulin. Three million kids, teens and adults with type 1 diabetes are counting on the FDA to get it right. Our lives and health are at stake. There are clearly mixed feelings about the ad running loose around the DOC. Some people feel that it is too harsh or "scary". Others feel that it is a really bold ad which could go a long way for educating the public about type 1 diabetes. 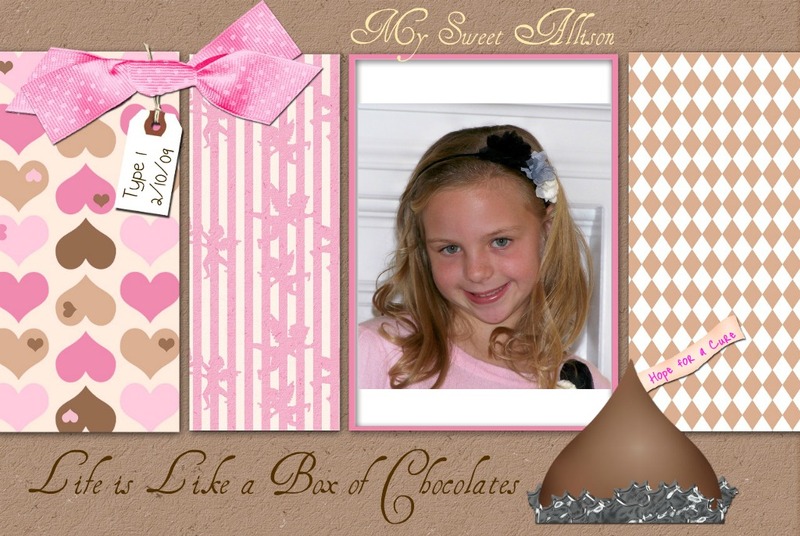 Amy at Diabetes Mine offers some good insight into these "mixed feelings". Aaron Kowalski from JDRF chimed in on "the ad" thread on CWD. "I want to say unequivocally that this ad has nothing to do with fundraising and everything to do with driving home the life saving and life changing potential of artificial pancreas technologies." I am not here to debate about the ad. But I do think that what Aaron Kowalksi says above is key in understanding the message behind the ad. I am not focusing on the one in twenty will die from low blood sugar. I already know what type 1 diabetes can do. The part of the ad that got my attention was the most revolutionary treatment since the discovery of insulin. I cannot change the fact that Ally has type 1 diabetes. But I can choose to be educated about it. I can choose to do everything in my power to make sure that she lives the best life possible. And I can choose to advocate for continued research and technology. I have no other choice! Do you know that diabetes has more than one type? If you are part of the DOC, or affected by diabetes in any way, no doubt you would be able to answer this question in much detail. But I would be willing to bet that the percentages of people who could answer goes down significantly for those not directly affected by one or both of these diseases. AND, I would go further to say that the percentages go down even more for those that have not somehow been affected by Type 1 diabetes. One of the reasons that I feel so sure of this is that if you had asked me back in 2008, I would have told you "sure, I know what diabetes is"...only to spout out information about type 2 diabetes. I also can tell you that we have encountered numerous individuals, who have shared their take and experiences with diabetes with our family. I know that they are well-meaning "advice-givers", however, they have got it ALL WRONG! Mostly, they are all quoting experiences of dealing with type 2 diabetes. Both type 1 diabetes and type 2 diabetes are serious! They both increase a person's risk for many health complications. But there are some real differences that matter between the two and I want people to KNOW! Causes: Type 1 diabetes is an autoimmune disease. It is caused when the body attacks itself, destroying the insulin producing cells in the pancreas. This leaves the person dependent upon receiving insulin via an insulin pump or multiple daily shots. Type 2 diabetes is a metabolic disorder. With Type 2 diabetes, the body is still producing insulin. The problem here is that it is either not producing enough insulin, or it is not able to use it effectively. Risk Factors: Type 1 diabetes is not preventable. Many people think of diabetes as resulting from an unhealthy lifestyle. This is not the case with type 1. Exercising more or eating certain types or amounts of food will not prevent or reverse type 1 diabetes. Genetics, being overweight and lack of physical activity are all risk factors that can lead to type 2 diabetes. Type 1 diabetes accounts for only 5-10% of the people with diabetes. The majority of people with diabetes have type 2 diabetes, accounting for 90-95%. -Symptoms usually start in childhood or young adulthood. People often seek medical help because they are seriously ill from sudden symptoms of high blood sugar. 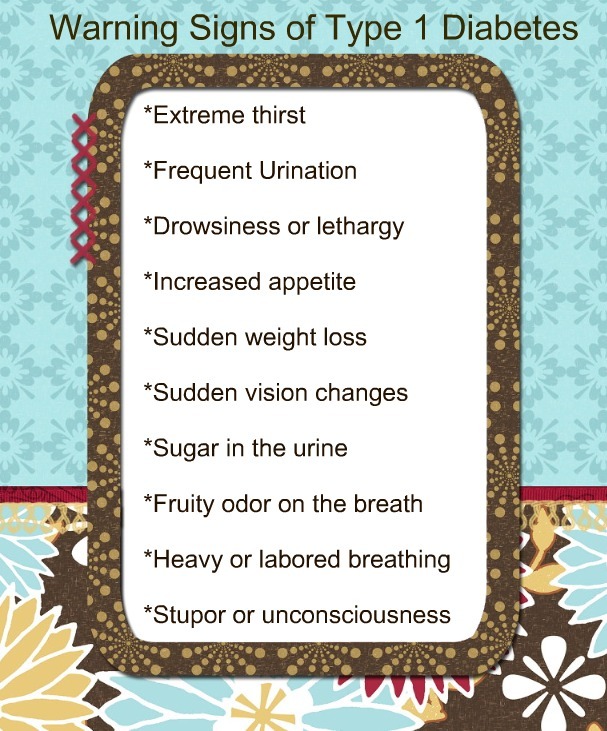 -Episodes of low blood sugar level (hypoglycemia) are common. -The person may not have symptoms before diagnosis. Usually the disease is discovered in adulthood, but an increasing number of children are being diagnosed with the disease. -There are no episodes of low blood sugar level, unless the person is taking insulin or certain oral diabetes medicines. 1. I'm mostly like everybody else...I'm not that different. 2. I have an insulin pump. I have a site and a needle goes in my body for the site. I also prick my fingers to check my sugar lots of times every day...I'd say like 20 times a day!! 4. I also thought it was because I ate too much sugar but it has nothing to do with that!!! 5. I didn't cause diabetes. My pancreas just said "I'm too lazy to do the work anymore." Three complications of diabetes can lead to blindness: retinopathy, cataracts, and glaucoma. Of people who have had diabetes for at least 15 years, 97% of insulin-taking patients and 80% of those not taking insulin have retinopathy; the most severe manifestation, proliferative diabetic retinopathy, occurs in 40% of those taking insulin and 5% of those not taking insulin. Of people who have had insulin-dependent diabetes for 30 or more years, 12% are blind. Diabetic retinopathy is the leading cause of new cases of legal blindness among the working age population. ...And a year later, I am still amazed at how smart and strong my little girl is! She wrote that when she was just 7 years old! When it comes to "Going the Distance" for Diabetes Awareness, Team Type 1 is unbeatable! They are truly an inspiration to the entire diabetes community...and beyond. 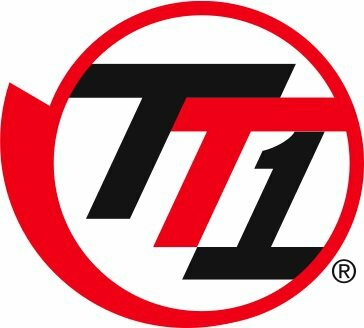 I would like to share this press release with you about what Team Type 1 and TrialNet are doing this November. Team Type 1, a group of elite athletes with type 1 diabetes, will Run Across America, starting in San Diego and crossing the New York City finish line on November 14, World Diabetes Day. Expecting to cover 200 miles a day for 15 days, the runners hope their 3,000-mile trek will help raise awareness of type 1 diabetes. At the same time, TrialNet, an international network of researchers exploring ways to prevent and delay the progression of type 1 diabetes, will be attempting to cross a finish line of its own. 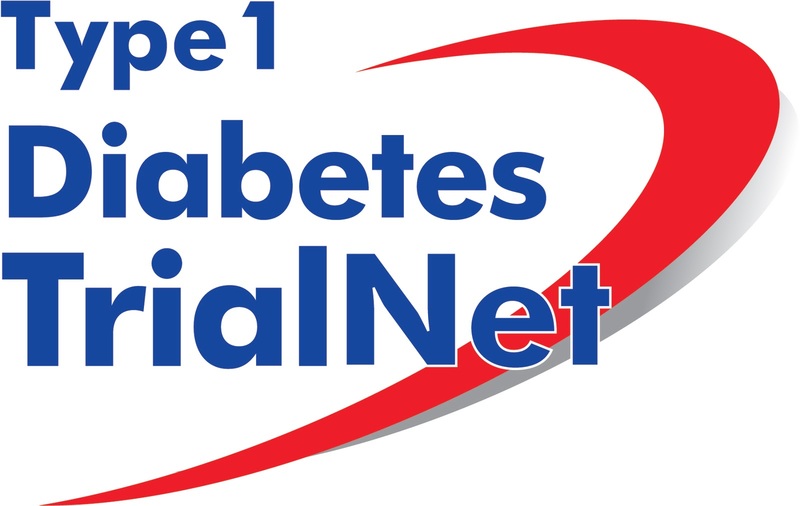 TrialNet’s goal is to screen an additional 3,000 people—one for every mile that Team Type 1 runs—for increased risk of type 1 diabetes. Reaching this goal will bring the total number of people who have participated in TrialNet research to 100,000. The test offered by TrialNet is not your standard type 1 diabetes test. This test can actually detect an increased risk for type 1 diabetes up to 10 years before symptoms appear. TrialNet offers the screening free of charge to relatives of people with type 1 diabetes (whose chances of developing the disease are approximately 15 times greater than those with no family history). Why is identifying increased risk so important? Screening is the first step in the pathway to prevention. Those identified at increased risk may be able to join research studies testing ways to delay and even prevent the disease. Team Type 1 and TrialNet want people to know that great strides have been made in early detection and treatment of type 1 diabetes. “These athletes inspire all of us, especially children newly diagnosed with type 1 diabetes,” said Bill Russell, M.D., TrialNet principal investigator at the Vanderbilt Eskind Diabetes Clinic. “They send a message that says people with type 1 diabetes can do anything!” Dr. Russell has accompanied Team Type 1’s cycling team as a team physician and witnessed their hard work and dedication firsthand. Nearly 200 TrialNet locations nationwide offer screening and research studies. Screening test kits are also available by mail. You and your family can join the team by getting screened for type 1 diabetes. To find a TrialNet location or to learn more, visit http://www.DiabetesTrialNet.org/ or call 1-800-425-8361. To learn more about Team Type 1 and follow the Run Across America, visit http://teamtype1.org/. Led by the National Institutes of Health, TrialNet is supported by the Juvenile Diabetes Research Foundation and the American Diabetes Association. Team Type 1 is a global sports organization changing the lives of people with diabetes around the world through racing, groundbreaking research, international outreach, and philanthropic initiatives in developing countries. 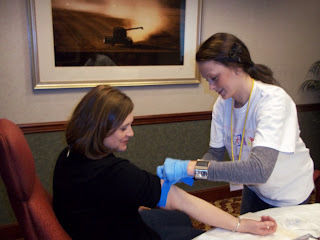 I had the TrialNet screening done this year with my friend Hallie. It was really quick and easy. Don't forget to visit the Team Type 1 site to track their Run Across America. It's been fun watching them Go the Distance! Diabetes Fact #4: Type 1 diabets can occur suddenly and causes a dependence on insulin for life. Until a there is a cure. Blue Fridays is an initiative to bring attention to World Diabetes Day, and to advocate and bring awareness for diabetes and the people living with it. Diabetes is more than a national issue; it's a world epidemic. This year, I want to rally the diabetes community to celebrate World Diabetes Day and Diabetes Awareness Month by asking people to wear blue every Friday during the Month of November and on World Diabetes Day (November 14). Please help spread the word. Thanks to Cherise for rallying the troops! 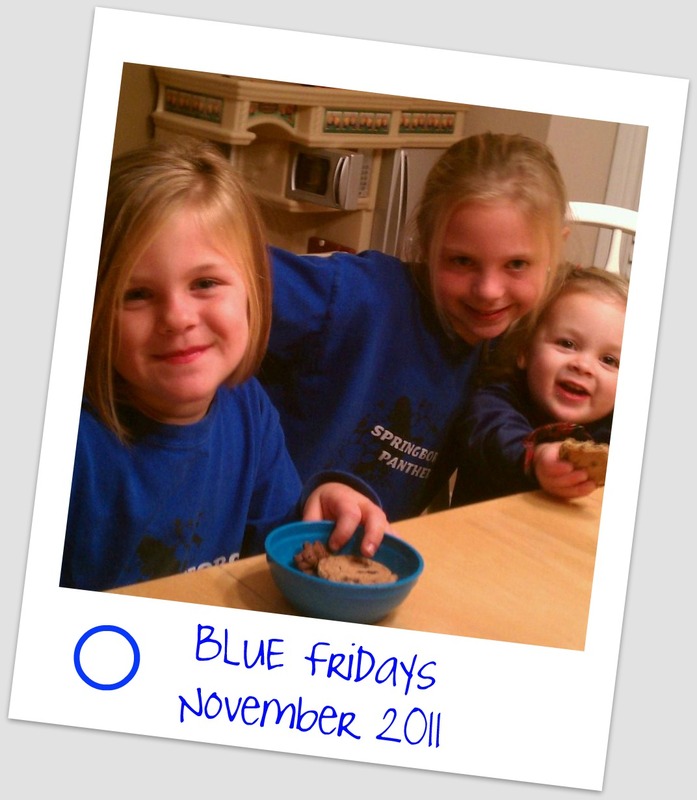 We will be wearing BLUE every Friday this month. Won't you join us? With this being Diabetes Awareness Month, I feel most compelled to spread awareness of the symptoms of Type 1 Diabetes. So, I'd like to share a guest post which I wrote back in July for my friend Heidi over at D-Tales. I apologize if you have read it before, however, these stories can't be shared enough. They could save a life. 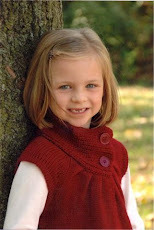 Ally was diagnosed with Type 1 Diabetes in February of 2009. I began blogging a little over a year later, in March of 2010. Many of my favorite blogs, written by fellow D Mamas, included their “diagnosis story.” I sat down back in March of 2010 with the intentions of writing our diagnosis story. But I couldn’t. It was still too raw for me. I tried again this year as we approached Ally’s two year diaversary. Still couldn’t do it. But since then something has changed. Ally and I met some new friends this week. We met a mother and daughter who live a somewhat parallel life to us. My new friend’s daughter was diagnosed with Type 1 Diabetes one year ago. As she and I were talking about each of our diagnosis stories, I got a sort of chill down my spine. I still have not written Ally’s diagnosis story, but there is a part that I feel needs to be shared. Just before Ally’s diagnosis I had noticed some changes in Ally. I now realize that they were classic Warning Signs of Type 1 Diabetes. Ally was extremely thirsty. Ally was urinating all the time. She became tired, very tired. She did not have enough energy to speak above a whisper. She could not hold her head up off of the arm of the couch, and eventually fell to the ground when she tried to stand because she did not have enough energy to hold her body up. I had noticed that she seemed to have a funny smelling breath and I kept asking her if she remembered to brush her teeth. Her kindergarten teacher had expressed concern that she was having trouble reading (even though she was reading chapter books upon entering kindergarten!) and that possibly we should have her eyes checked. A few of these symptoms happened over a couple of weeks, but for the most part they all came to a head in one weekend. Now, the reason that I feel compelled to share this part of our diagnosis story is because of the response that I got when I called the pediatrician’s office early on the morning of February 10, 2009. I asked to speak to a nurse because I was so concerned about Ally and was debating whether or not to just drive her to the ER. I described ALL of the above symptoms to this nurse and she told me that I should bring Ally in to see the doctor and she could get me in at noon. I said that wasn’t soon enough, I AM DEBATING TAKING HER TO THE HOSPITAL…SOMETHING IS NOT RIGHT! She told me to calm down. She told me to give her some juice. Let me repeat….give her some juice! And bring her in at noon. I put Ally in the car immediately and drove to the pediatrician’s office (it is about 5 minutes from our house). I said that I needed one of the doctors to see her immediately. They did take me in. And a few short minutes later, we were on our way to Children’s Hospital ER with a “99% sure” diagnosis of type 1 diabetes. Since that day, I have replayed the conversation with the nurse over and over again. I am shocked that she did not even have a suspicion that it could have been diabetes. I am shocked! And then when talking with my new friend about her daughter’s diagnosis, I heard a similar version of that conversation with our nurse. She had taken her daughter to the doctor because she thought she had a UTI. They took a urine sample. They told her that she did not have a UTI, but she did appear to have all the symptoms of one, so they treated her for that. Six days later this very persistent Mama went back and demanded another urine sample and blood work…the idea of type 1 diabetes had somehow (miraculously!) popped into her head one night while she laid awake worrying about her little girl. This time the nurse told her that they had been meaning to call her because her daughter was spilling sugar into her urine…uh, this was 6 days later folks!! I am so concerned about the lack of awareness about Type 1 Diabetes. I’m not talking about what we go through on a day to day basis. Nor am I talking about the lack of knowledge out there about the difference in type 1 and type 2 diabetes (that’s a story for another day!). I’m talking about the warning signs. Yes, the signs can come on quickly and they also can look like many other illnesses. But speaking for myself, as a parent, as a teacher of young children, I did not know about these warning signs. And obviously, hearing of just these two accounts, we have more than one member of the medical field who also does not recognize these warning signs and symptoms. Something needs to be done. Warning Signs of Type 1 Diabetes need to be taught (or re-taught) to all those in the medical field, shared within schools, posted for parents. Something needs to be done. And if not us, then who? Diabetes Fact #3: Type 1 diabetes, sometimes referred to as Juvenile Diabetes, can strike at ANY age. And whenever it hits you, it's forever. Until a cure. You picked the WRONG month to leave your comment on my blog! You see this is November. This is Diabetes Awareness Month. This is the time to educate others about type 1 diabetes and to spread awareness so that one day we may have a real life cure. Then again, as I'm typing this, I'm thinking that maybe your comment came at just the right time. You have proven why it is so important for us to spread awareness...because there are so many - LIKE YOU - who don't have the facts straight! I welcome you to follow my blog, especially this Diabetes Awareness Month, so that you too may clear up your misconceptions. The comment that I am referring to in the above note ironically was submitted on the first day of Diabetes Awareness month on a very old post of mine Ten Things I Hate About You Diabetes. Here is the idiotic comment (which I am sharing here to make a point, but NOT publishing on my blog post as a comment). Diabetes is truly a pain to deal with. In this case, the old adage "prevention is the best cure" holds true. I'm glad you came up with this post, because I'm sure it will warn a lot of people before they start having diabetes themselves. P.S. You got one thing right in this comment - Diabetes is a pain!!! But I challenge you to PROVE to me that I could have done something to prevent Type 1 Diabetes from happening to my little girl.